Demonstrators marked Earth Day with a march through the streets of Manhattan. The March for Science, one of several held across the country, was planned as a response to the proposed budget cuts and political appointments of President Donald Trump, marchers said. Many got creative with their signs, pulling inspiration from the science field itself. Scroll down for photos from Saturday's march. Demonstrators in the March for Science march past Trump International Hotel and Tower in Manhattan, Saturday, April 22, 2017. Charlotte Zucker, 5, with her mother, Cherie, at the March for Science on Central Park West in Manhattan on Saturday, April 22, 2017. Noni Pratt of Queens on the subway with the sign she carried at the March for Science in Manhattan on Saturday, March 22, 2017. It rained on participants in the March for Science on Central Park West in Manhattan on Saturday, April 22, 2017. Participants at the March for Science in Manhattan on Saturday, April 22, 2017. A demonstator carried a colorful anti-Trump sign at the March for Science in Manhattan, Saturday, April 22, 2017. Demonstrators strode past Trump International Hotel and Tower in Manhattan during the March for Science on Saturday, April 22, 2017. Demonstrators in the March for Science walk by Trump International Hotel and Tower in Manhattan on Saturday, April 22, 2017. Demonstrators in the March for Science in Manhattan on Saturday, April 22, 2017. 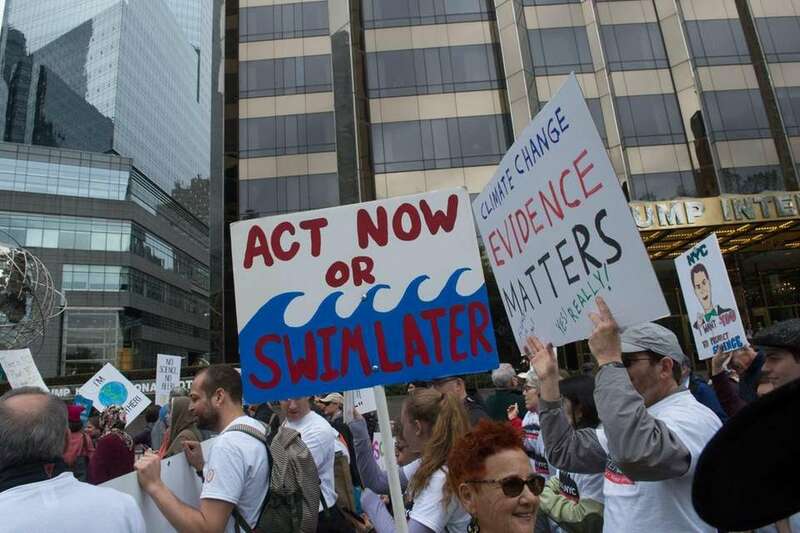 March for Science protesters stressed the need to study climate change as they walked past Trump International Hotel and Tower in Manhattan on Saturday, April 22, 2017. March for Science protesters in Manhattan on Saturday, April 22, 2017. People carry puppets past Trump International Hotel and Tower in Manhattan during the March for Science on Saturday, April 22, 2017. Demonstrators take part in the March for Science in Manhattan on Saturday, April 22, 2017. March for Science protesters fill a street in Manhattan on Saturday, April 22, 2017. Science was the word of the day at the March for Science in Manhattan on Saturday, April 22, 2017. A protester at the March for Science in Manhattan on Saturday, April 22, 2017. The March for Science in Manhattan on Saturday, April 22, 2017. Demonstrators wait to enter at 64th Street and Central Park West early Saturday, April 22, 2017, to join the March for Science in Manhattan. The march route was from Central Park West to Broadway and then south on Broadway. Demonstrators attend a rally before the March for Science in Manhattan, Saturday, April 22, 2017. March for Science demonstrators on Central Park West in Manhattan, Saturday, April 22, 2017. Demonstrators in the March for Science turn onto 71st Street heading for Central Park West on Saturday, April 22, 2017. March for Science demonstrators fill a street in Manhattan, Saturday, April 22, 2017.
Cooper Wong, 2, holds a sign as he takes part in the March for Science on Saturday, April 22, 2017, in Manhattan. March for Science demonstrators walk past the Trump International Hotel and Tower on Central Park West on Saturday, April 22, 2017. A woman smiles from behind her sign on Saturday, April 22, 2017, during the March for Science in Manhattan. A woman with a "Go Green" sticker on her face takes part Saturday, April 22, 2017, in the March for Science in Manhattan. A demonstrator holds a sign that says "I'm with her," with an image of the Earth on Saturday, April 22, 2017, during the March for Science in Manhattan. Demonstrators participate Saturday, April 22, 2017, in the March for Science in Manhattan. Protest signs fill Central Park West in Manhattan Saturday, April 22, 2017, during the March for Science. A demonstrator holds a protest sign Saturday, April 22, 2017, during the March for Science in Manhattan. Demonstrators, some with signs, march along Central Park West Saturday, April 22, 2017, during the March for Science in Manhattan. Protest signs were plentiful Saturday, April 22, 2017, during the March for Science in Manhattan. A "Science makes America great" sign is seen among the crowd Saturday, April 22, 2017, during the March for Science in Manhattan. Demonstrators wait Saturday, April 22, 2017, for their turn to join the March for Science in Manhattan. The March for Science heads down Central Park West Saturday, April 22, 2017, on its way to Broadway and points south in Manhattan.